And celebrate our 3-Year Anniversary! White: 2006 Bibich Debit Barrique, Croatia: An oak-aged version of Bibich's classic Debit (Debit is the grape variety).The aging regimen consists of 12 months in new American oak barrique prior to bottling. 12% alcohol. Clean, crisp pure fruit. Red: 2007 Dingac Peljesac, Croatia: The village of Dingac, on the Adriatic Sea, makes Croatia’s most famous red wine, Plavac Mali. This is the original Zinfandel. You will get the dark berry quality of Zin but the more like the weight of a Dolcetto or Beaujolais. 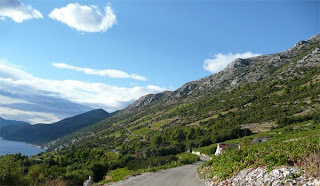 Reserve Red: 2005 Dingac Postup, Croatia: The Postup vineyard on the Dalmatian coast has some old Plavac Mali vines planted. This bottling represents the best of those grapes with a little bit of bottle age.